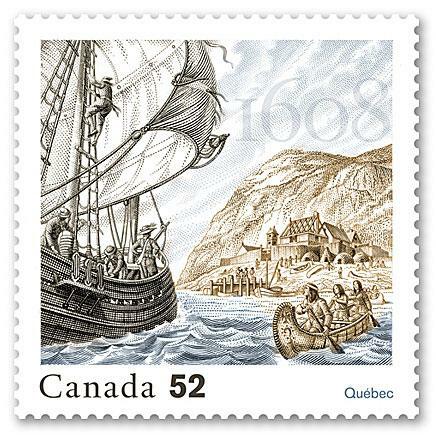 Completing a five year series of issues celebrating the first French settlement in North America, on May 16, 2008 Canada Post and France's La Poste jointly issued a 52 cent commemorative stamp to mark the 400th anniversary of the founding of Quebec. The stamp design is based on an illustration by Francis Back, a Canadian artist known for carefully researched, beautifully executed historical illustrations. The stamp depicts Native Americans paddling a canoe and approaching explorer Samuel de Champlain's ship. On shore Champlain's men are building the habitiation, a three story building that was part home, part fort, and part warehouse - the beginning of the Kebec (Quebec) settlement. Kebec in the Algonquin language meant "the place where the river narrows." The stamp series began in 2004 and tracked the first settlers as they struggled to gain a foothold in the new land. Earlier stamps in the series showed Pierre Dugua de Mons, Port-Royal, Champlain surveying the East Coast, and Chief Henri Membertou, Grand Chief of the Mikmaq. Although all the stamps in the series were produced to high standards, the Founding of Quebec design stands out. With the exception of the date, the entire stamp was printed using intaglio, executed by master engraver Jorge Peral. The previous stamps in the series had blended intaglio and lithograph. Intaglio is a 400-year-old Italian printmaking technique in which prints are created by engraving (cutting or carving) the surface of a metal plate. The plate is covered with ink and then wiped so that the ink remains only in the carved areas. When a damp paper is pressed against the plate it picks up the ink and the image is formed. Intaglio and other engraving techniques were once used exclusively in stamp production and are associated with the high level of artistry seen in classic philately. Lithographic techniques are associated with the multi-colored issues of modern times. The quality of early lithography was quite poor compared to engraving, and although there have been many improvements over the years, lithography still does not achieve the level of fine detail possible with engraving. Champlain's was not the first French attempt to establish a settlement in Canada. Previous settlements didn't last, however, and interest in the area was not a priority of the French Crown - not until the few fishermen who did stay around began to develop a viable fur trade. Then Henry IV decided he was interested in a permanent French settlement in the region. "I arrived there on the 3rd of July," wrote Champlain in 1608, "when I searched for a place suitable for our settlement, but I could find none more convenient or better situated than the point of Quebec." He was right. The high cliffs and narrowing river made it easy to control and defend. Unfortunately, he did not know how to defend against scurvy. Only nine of the thirty-two colonists survived the harsh Quebec winter. Sadly, they could have easily cured the scurvy if they had known about the leaves of the white cedar trees around them. Had they boiled the leaves and drunk the bitter water, they would have been saved. Despite this terrible loss, the Quebec settlement survived. By the mid 1800's it was a major port, and today it is an exciting, beautiful, historic city. Known as the father of Hungarian impressionism, Károly Ferenczy was a leading member of the artist colony of Nagybánya in Transylvania. This 2012 stamp issue shows his painting Morning Sunshine.